While watching the Biggest Loser (Yes, it is my guilty pleasure!) I watched the contestants take on the Flying Trapeze. It looked like fun and I jumped straight onto my iPad to see where I could do it in Melbourne. I came across the Flying Trapeze Centre Melbourne. They run a range of beginners classes and courses in Trapeze. 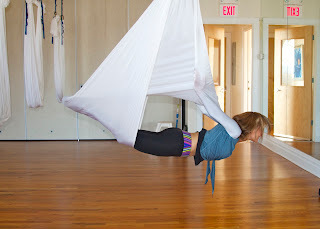 They also run Anti-gravity Yoga classes, this quickly distracted me from the Trapeze and before I knew it I had booked myself and Lady E in for a class. 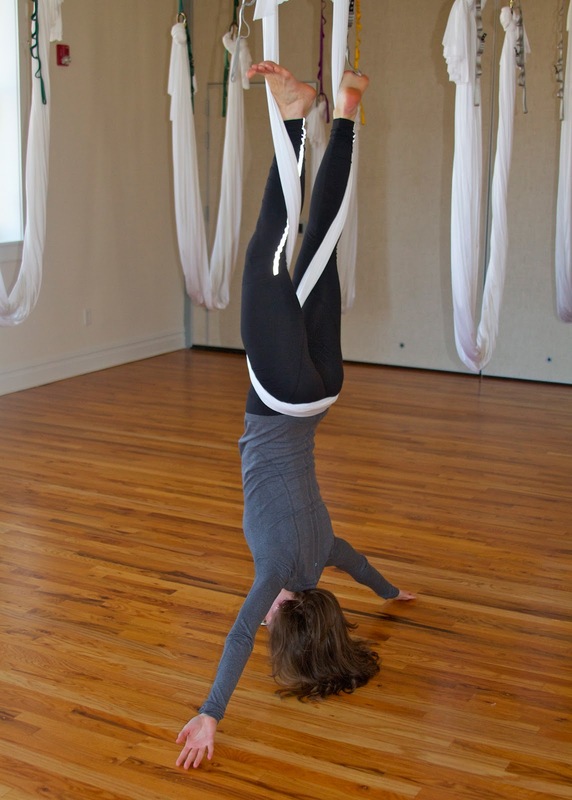 So you may ask what is Anti-gravity yoga? Well, it has all the core principles of Yoga and some Pilates with the difference that you use a silk hammock that is suspended above and sits three feet above the ground. Here is a YouTube clip to give you and idea. I was so excited about the class, so much that I was banned from saying "Aerial Yoga" at work. I was mesmerised by the every so talented and fit Pink when on her Funhouse tour she twisted, flipped and turned on the Ariel silks. Maybe I could do this.. So the time had come to go to the class. Super enthusiastic, Lady E and I arrived at the Blackburn location for our class. One of the best things is there are only 5 people in a class. It is great as you get the guidance and technique from your instructor. Holly, took our class and was kind to us first timers. I thought we would only do some basic moves, but within the first five minutes we were upside down in the "Monkey Pose". It was a great relaxed class and were able to talk. I thought that maybe I would look super hot like Pink did in her circus tour she did. Unfortunately and upside down Lady Fable ain't that pretty. I loved the names of some of the Poses, The Peanut, The Mosquito, but my favourite was the Vampire (see below). In short it is a super fun class and after one class I am already hooked. Like a normal yoga class you really work your core and there is also an element of getting past the fear of swinging and hanging upside down. I am so hooked I have booked in for the 5 week course that starts in a couple of weeks. If you are interested and what to check it out jump on the Flying Trapeze Centre Melbourne website and book online!